We examined the ability of stingless bees to recruit nest mates to a food source (i) in group foraging species laying pheromone trails from the food to the nest (Trigona recursa Smith, T. hypogea Silvestri, Scaptotrigona depilis Moure), (ii) in solitary foraging species with possible but still doubtful communication of food location inside the nest (Melipona seminigra Friese, M. favosa orbignyi Guérin), and (iii) in species with a less precise (Nannotrigona testaceicornis Lep., Tetragona clavipes Fab.) or no communication (Frieseomelitta varia Lep.). The bees were allowed to collect food (sugar solution or liver in the necrophageous species) ad libitum and the forager number to accumulate, as it would do under normal unrestrained conditions. The median number of bees collecting differed considerably among the species (1.0–1436.5). It was highest in the species employing scent trails. The time course of recruitment was characteristic for most of the species and largely independent of the number of foragers involved. 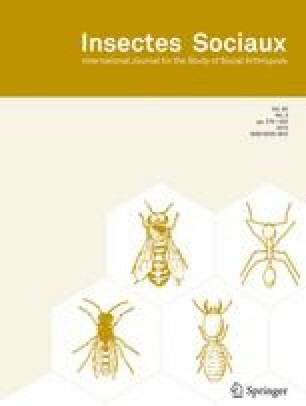 The two Melipona species recruited other bees significantly faster than T. recursa, S. depilis, and N. testaceicornis during the first 10 to 30 minutes of an experiment. In species laying a scent trail to guide nestmates to a food source the first recruits appeared with a delay of several minutes followed by a quick increase in forager number. The median time required to recruit all foragers available differed among the species between 95.0 and 240.0 min. These differences can at least partly be explained by differences in the recruitment mechanisms and do not simply follow from differences in colony biomass.